Caesars Entertainment Partners with Event Design Collective to Introduce the Event Design Certificate (EDC) program. Caesars Entertainment Corporation (NASDAQ: CZR, “Caesars Entertainment” or “Caesars”), the world’s most geographically diversified casino-entertainment company, partners with Event Design Collective GmbH (EDCo), the globally active creators and trainers of the Event Design using the Event Canvas™ methodology based in Switzerland (as well as the Netherlands, Canada, Spain, Germany, Italy, France and the Philippines) to introduce an innovative approach and Event Design Certificate program in designing meetings and events for the future. With the goal to certify 1,000 meetings industry professionals including Caesars Entertainment sales and convention services teams as “CED – Certified Event Designers” by 2022, Caesars Entertainment just concluded a three-day training course in Las Vegas. This is the beginning of a 36 month partnership providing Event Design Collective’s immersive training and coaching program. Sponsored summits and industry events are planned for Las Vegas that will take the stakeholder alignment and event design process to the next level. Dates will be announced shortly. “It is part of our DNA at Caesars Entertainment to listen to our customers, understand their individual needs and specific goals, and to leverage our facilities and team members to help our customers achieve those goals. Event Design Collective is allowing us to build on our inquisitive nature by giving us a common language to communicate with our customers in, and a game changing framework to help our customers achieve their objectives. Partnering with Ruud Janssen and Roel Frissen, Co-Founders of Event Design Collective, will continue our mission at Caesars Entertainment. We are thrilled to collaborate with Event Design Collective so we can help our customers plan and execute world class meetings and events.” said Michael Massari, Chief Sales Officer of Caesars Entertainment. The Event Design Certificate (EDC) Program is an immersive three-day design training course followed by six-months of coaching on a real-life event. At the program, participants learn how to apply design thinking with the #EventCanvas, facilitate their team through the process and articulate the way their event creates value strategically or just approach events in a different way. Analyzing stakes, design and prototype with like-minded peers using the #EventCanvas as a visual language for events. Prospective CED – Certified Event Designers participants learn how to master and facilitate the signature Event Design using the #EventCanvas™ methodology by applying the practice of design thinking to events. “Event owners are faced with the need of change. They are challenged to understand how to implement that change with their events. We have created this three-stage process that we teach teams or work with them directly on applying it in their organization. It allows them to get a grip on how their own events create value and how to measure success through behavior change. Ultimately through applying the Event Design using the Event Canvas™Methodology they become change makers and confident leaders of event design in their own organization.” said Ruud Janssen & Roel Frissen, co-creators of the Event Canvas and co-authors with Dennis Luijer of the bestselling Event Design Handbook. “The support of Caesars Entertainment to equip their teams and industry professionals at large with the Event Design skillset is an important milestone for the development in the US of the common language of event design we have started in 2013. It will put Caesars Entertainment at the forefront of the market when it comes to systematically designing innovative events using the Event Canvas.” according to Ruud Janssen and Roel Frissen, managing partners of the Event Design Collective GmbH. “Experience & Event design is not a singular act when planning a meeting, but a strategy deployed around the entire existence of a customer’s event portfolio and how it supports their organization’s objectives. A meeting sales organization that has meaningful conversations with their customers builds deeper relationships supporting customer’s objectives. With this delivery, meetings will be differentiated, and Caesars Entertainment will be a more valued partner on a long-term basis.” according to Lisa Messina, Vice President of Sales at Caesars Entertainment. There are three levels of the Event Design Certificate Program ranging from basic event skill set and awareness of stakeholder alignment techniques to mastery of the full process as a facilitator. 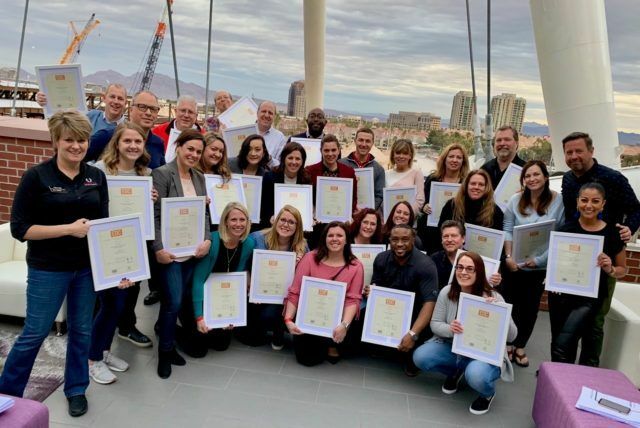 After a successful completion of the program and peer review of the real-life case study, meeting industry professionals and Caesars Entertainment sales, catering and convention services managers will be attaining the “CED,” a Certified Event Designer, designation and join the strong alumni community of CED Event Design Thought Leaders across the globe.